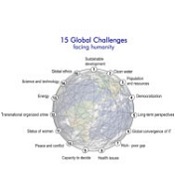 Stimulate futures prospective awareness among youth and teachers around the world to imagine new alternatives for addressing the 15 Global Challenges outlined by the Millennium Project; and hence, help achieve the 8 UN Millennium Development Goals. Inspire creativity, responsibility, and solidarity among the youth of the world. 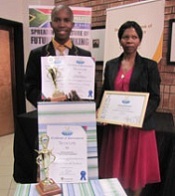 Mr. Thabang Sebetoane of Dr. Reginald Cingo High School in Kroonstad won an International prize in 2009 for Challenge 14: Science and Technology. All the contestants were honoured during the Awards ceremony that was held; 25th February 2011 at Development Bank of Southern Africa (DBSA).